Do you want to get serious about finding gold in Oregon, but have no idea where to go? Do you want a place in Oregon where you can start finding some gold of your very own? Start Finding Gold – A Guide to Prospecting in Oregon is jam packed with documented locations where gold has been found within the state, with an extensive look at the well-known historical mining areas and many lesser-known areas as well. Hundreds of creeks, rivers, gulches, and mines are mentioned in this eBook that have all produced gold in the past, and will lead you to places to find gold today! Right now you can purchase this awesome resource for gold mining in Oregon for the low price of just $7, regularly $12. Think about how much money you spend on gas just driving into the hills searching of gold and you will realize that $7 is a heck of a deal! PLUS: You will also receive these bonuses included with your book for FREE! 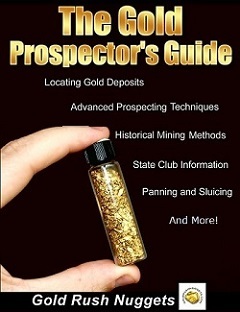 A list of all the prospecting clubs and associations in Oregon, so you can meet fellow prospectors in your area and learn more about prospecting for gold! Information about several public panning sites throughout the State of Oregon. These are all areas that are designated for recreational prospecting and do not require a mining claim or any special permission. Just throw your gold pan in the car and go! 30-day Guarantee! We know that this guide will help you find areas to prospect for gold in Oregon. If for any reason you are not satisfied, we will gladly give a full refund. We offer this 30-day guarantee because we know that this eBook will help you find some great places to look for gold! Start Finding Gold! 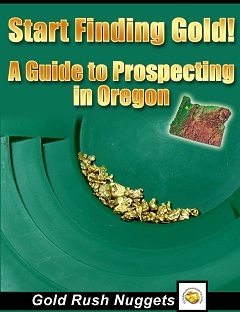 - A Guide to Prospecting in Oregon - 40-page eBook about where to finding gold in Oregon. *The Start Finding Gold! eBooks are automatically emailed to you as a printable PDF after purchase. No waiting and no shipping charges. 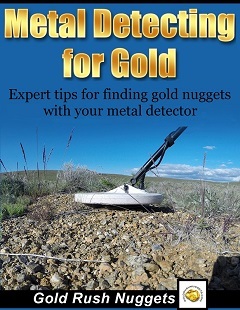 *This eBook has hundreds of locations where gold has been found in Oregon. Please understand that many of these places may currently be on private lands, active mining claims, or within areas of special regulations. It is the readers responsibility to ensure that they are in an area open to prospecting. This content of this eBook is for informational purposes only.